Chain link fencing can provide years of maintenance free and long lasting protection. It is the preferred fencing for residential areas because of its affordability, durability and ease of care. It can be used as a boundary for your property, as well as to help keep your children and pets safe. Galvanized Chain Link: The steel components of this fence are coated with zinc, to ensure longevity. The caps, rail ends and line tops are made from die-cast aluminum, including the ties that connect the chain link to the framework. Vinyl Chain Link: The components for this type of chain link are the same as the galvanized version; however, the actual mesh (chain link) is coated with vinyl polyester. It comes in black, brown, green and white, and provides an attractive appearance. 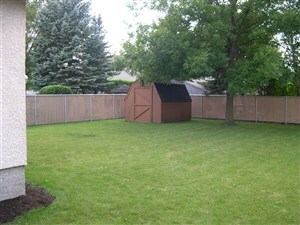 Painted: For a complete change of appearance, you can choose a painted fence. It begins with the original galvanized fencing, and from there, the chain link (mesh) is coated in the vinyl polyester. All other components are powder coated, to enhance durability and appeal to your fence and property. Privace Weave: For a dditional appeal as well as privacy, a durable plastic slat can be woven through the mesh of your fence. It comes in 9 distinctive colours. Bestway Fence Systems is a proud authorized installer for both Iron Eagle and Ameristar Ornamental fences. 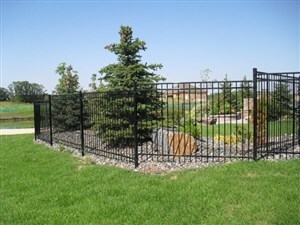 These beautiful fences are constructed of a superior quality coa ted steel product. The components are put together with a smooth appearance, to create lovely, long lasting features to your home and property. Ornamental fences are an attractive option for fencing in your pets, and helping to ensure that your children are safe. They come in a variety of shapes and heights to suit your personal preferences. Please contact our office, to find our more about these beautiful fencing options. Bestway would love to help you surround yourself with one of these lovely fences.